"The residents used knives to slaughter the crocodiles. 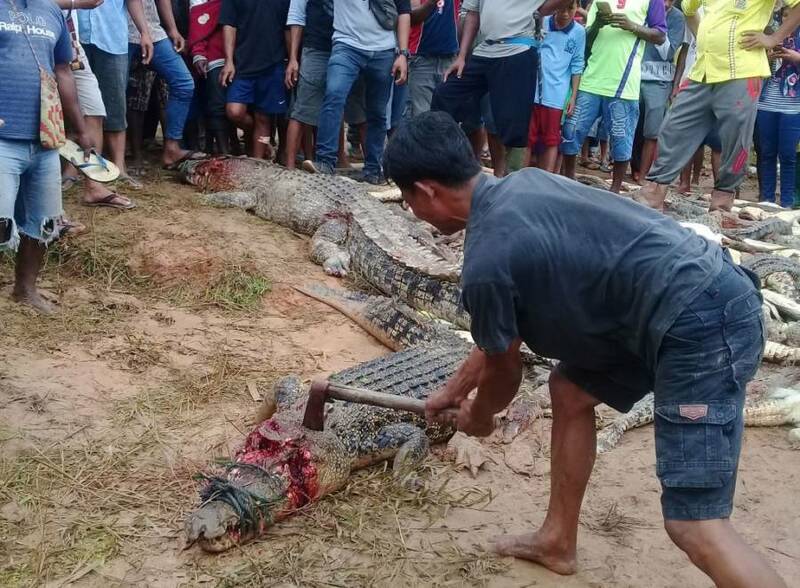 The crocodiles were caught and dragged outside and stabbed to death. It was so horrid to see." 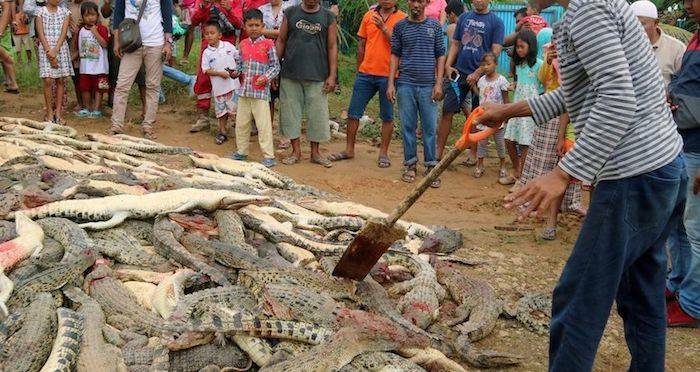 Nearly 300 crocodiles of endangered varieties were recently slaughtered at a breeding ground and sanctuary in Indonesia after a local man was killed by one of the animals a week prior. 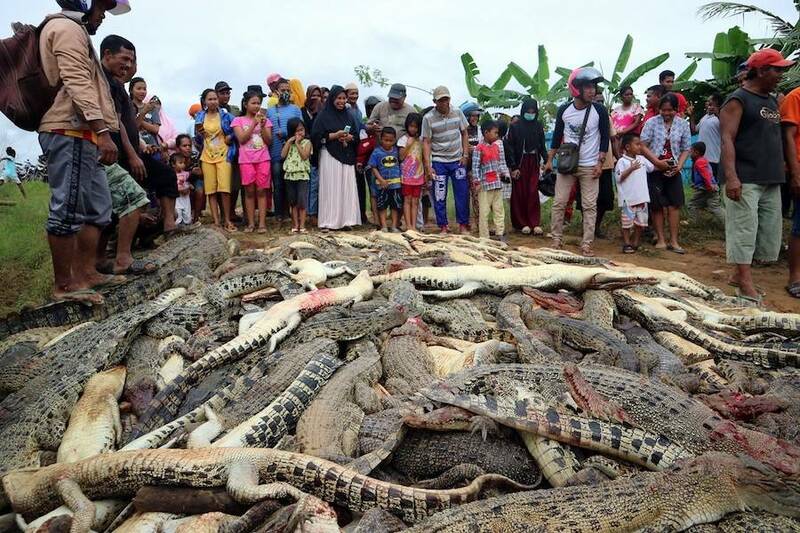 Immediately following the July 14 funeral of a local man known only as Sugito, who was killed by a crocodile when he entered the sanctuary in Indonesia’s Sorong district, a mob of some 600 angry locals made their way to the breeding pond and killed a total of 292 crocodiles. The trouble began on July 13 when Sugito, whose age has been reported both as 31 and 48 by different sources, reportedly entered the sanctuary to cut grass for his cattle (though accounts do vary) when he was confronted with a crocodile. “An employee heard someone screaming for help, he quickly went there and saw a crocodile attacking someone,” said Basar Manullang, the head of West Papua’s Natural Resources Conservation Agency. Olga said that by the time Sugito was found, he had already died from the attack. The revenge killings immediately followed Sugito’s burial on July 14. According to witnesses, about 40 policemen who arrived on the scene were unable to stop the situation because they were so greatly outnumbered by the locals out for revenge. But now some of those in the murderous mob may be in trouble themselves. “Since killing the crocodiles is illegal, we are coordinating with the police for the investigation,” Munullang said. Manullang explained that in 2013 the farm was granted an official permit by the Environment and Forestry Ministry to breed endangered saltwater and New Guinea crocodiles for preservation with the stipulation that they didn’t disturb the community. Next, read up on the WWII Ramree Island massacre that saw hundreds of soldiers killed by crocodiles. Then, check out the story of Rod Ansell, the real-life Crocodile Dundee.